In 1952 Swiss mountaineer André Roch coined the Khumbu Icefall the “Suicide Passage.” Not much has changed in the past 60 years. 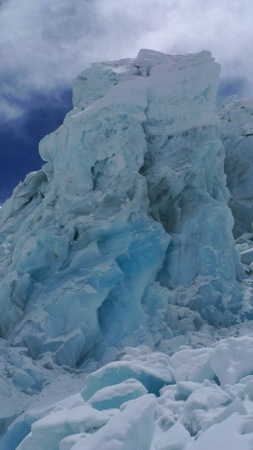 The mile-long frozen waterfall that ascends almost 2,000 vertical feet from Everest Base Camp to the Western Cwm is the only way to approach the mountain from the south side. Its constantly shifting maze of crevasses and frozen ice towers—which can topple at any second—makes every climber feel queasy. 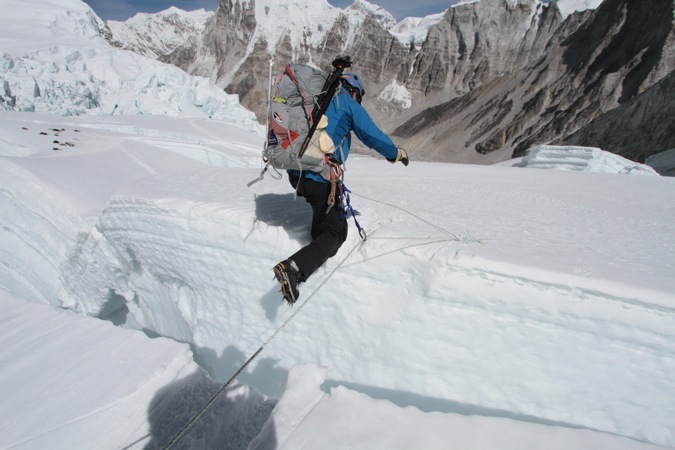 “You have the chance of being in the wrong place at the wrong time all of the time in the Khumbu Icefall,” says Scott Simper, Jamie Clarke’s climbing partner and photographer. 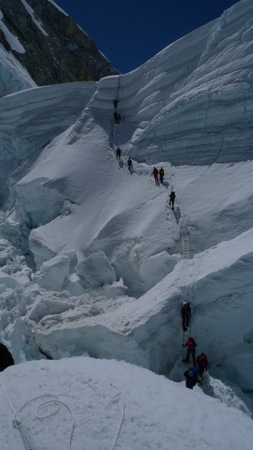 To make traversing the Icefall easier, every year in the beginning of the season, a team of six Sherpas, called the “Ice Doctors,” which are led by 57-year-old Ang Nima Sherpa, set a fixed line of ropes and ladders to help climbers navigate their way through the hazards and crevasses. It’s a dangerous job, but Ang Nima has a secret weapon. 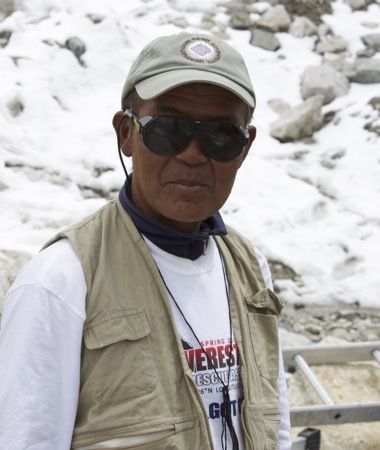 “There’s some danger, but I go to the monastery, and every day I pray to Buddha and Buddha helps us,” says Ang Nima, whose camp is right next to our Expedition Hanesbrands headquarters. 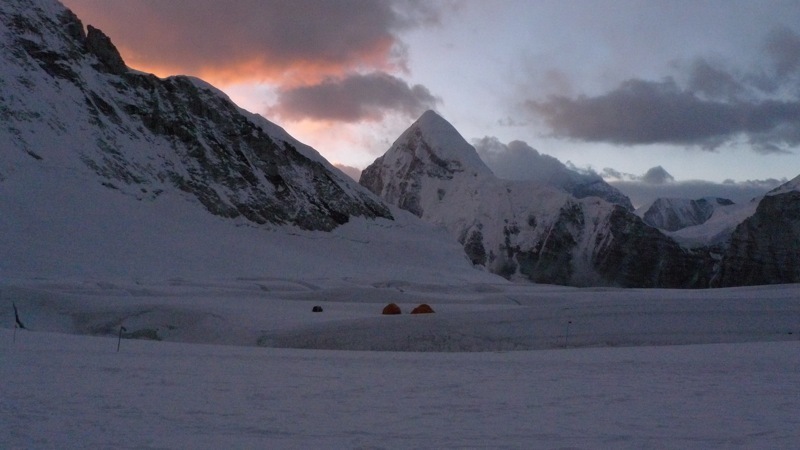 Since they arrived at Base Camp in early April, Simper and Clarke have traveled through the Icefall six times on their acclimatization trips up and down the mountain. Their team of climbing Sherpas, responsible for stashing gear and food higher on the mountain, have traversed it maybe ten or 12 times. 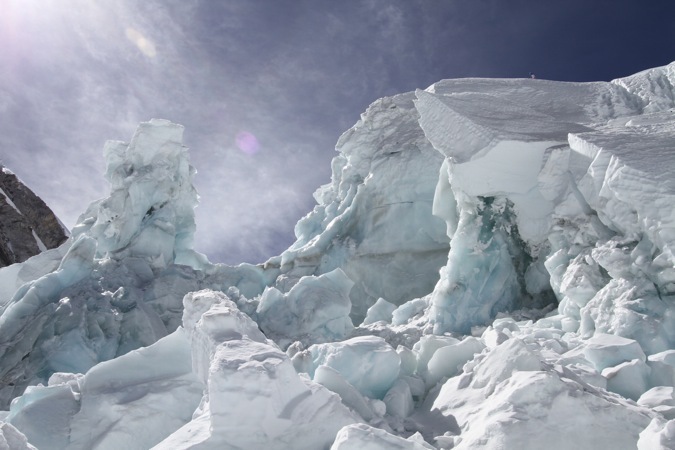 So what makes the Icefall so crazy? 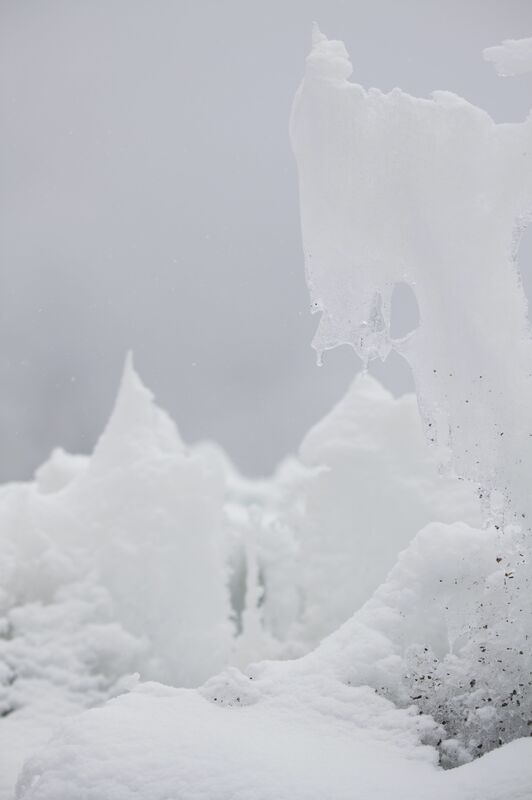 It’s like a maze in a video game that gets more hazardous the longer you play: First you wind your way from Base Camp through an unroped, relatively benign section of mini ice towers. “It’s a very fascinating, very beautiful place to get your feet wet,” says Simper. The next section is called the Dam, a 20-minute segment of 70-degree climbs. 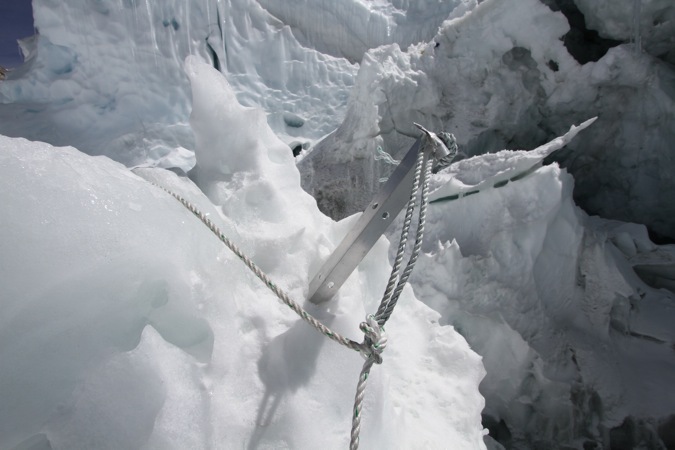 After that, you climb up and down a few ladders to the “Popcorn” section, where the ropes meander up and down and over about eight ladders that bridge deep blue crevasses. After Popcorn comes the “Football Field,” a flat, wide section where climbers finally have the chance to take a breather. 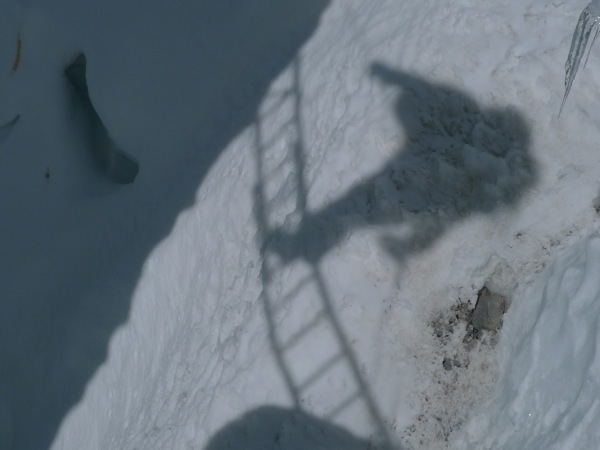 From there they go through a section Simper and Clarke call the “Valley of Death” a section where climbers are surrounded by the largest seracs in the Icefall, whose bases are being melted by the sun. That section exits into what they call “Crazy Town,” a deep trench into which the climbers descend (and hopefully ascend), with dozens of spires and crevasses, where the leaning tower almost crashed on the Sherpas. 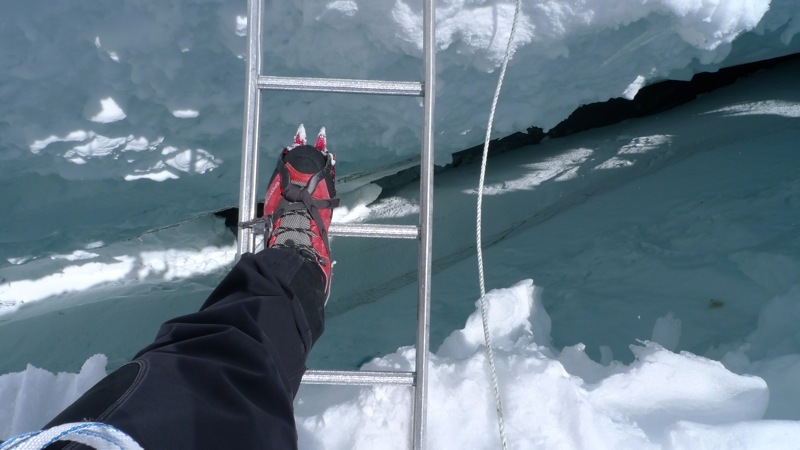 Finally, there’s a climb up to a flat spot, then back down three ladders strapped together over a deep crevasse, then a climb up and over three more ladders to reach the top of the Icefall and the Western Cwm. The freakiest aspect: The route can change from day to day, so the climbers never know what to expect. 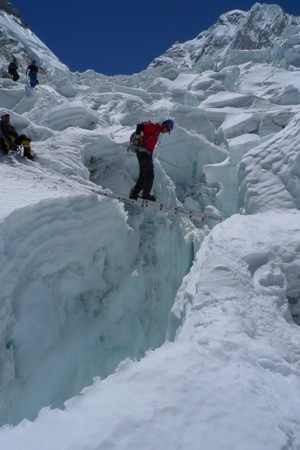 Despite the risks, dozens of climbers travel through the Icefall unscathed every day. 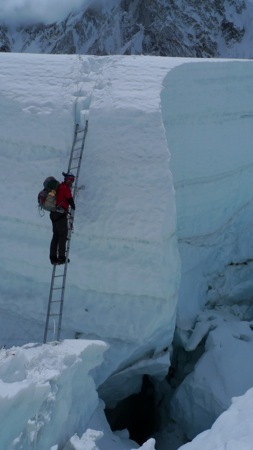 “No sound mountaineer would enter the Khumbu Icefall if it weren’t for the jewel of Everest beyond,” says Jamie Clarke.